"It was a very nice and peaceful experience for me once again when I walked by foot to reach my office in New Delhi on last Tuesday. I started my journey early in the morning from my residence and completed the distance of about 30km in four hours without any halt on the way. 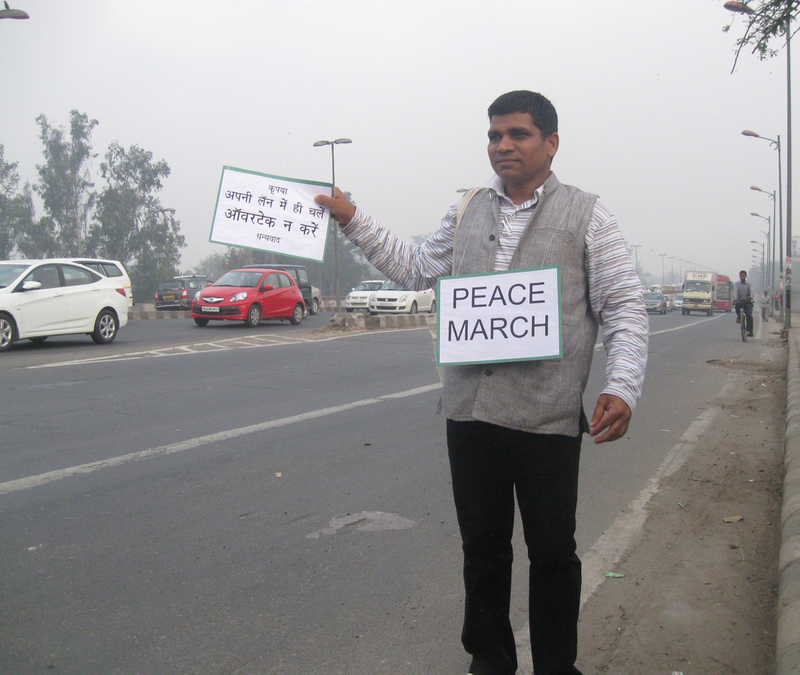 This was a solo and individual march held as a part of my annual programme of continuous walking in Delhi. Except some minor pain everything was normal and I felt that my journey was a combination of physical and mental exercise. The joyful outcome of the walk was much spiritual because it was a long lone journey without any disturbance. "I have been doing this exercise for long but nobody was aware about it except my limited friend circle and my co-travelers. Almost everyone praised my effort and gave good wishes for this campaign but no one took trouble to join me although many of them often crib about their everyday up-down and uneasy office journey due to public transport related problems. I could not insist them even at once and could not explain them the benefits of such exercise. Many of them are also regular joggers but they also can't go away from the up-down stress. So this time I thought to put up a message tag to mark this travel. "I have been regularly doing this exercise from last 5-6 years. I go to office or home by walking. I avoid use of any transport mode during such walk of around 25-30 km at least once in a year through different routes and different destinations. Generally I choose day of some relevance like my birthday, anniversary or some historical event that falls on working day. Initially, I used to walk to Saibaba temple at Haus Khas, Rohini, Lodi Road and Vasant Kunj, covering the route of my workplace. Later, I experienced this walk as a matter of fun and a much effective way of fitness not only for body but also a powerful mean to balance my mind and body. I am of the opinion that if people try to avoid too much dependence upon vehicles and prefer to walk purposefully rather than jogging in parks they can keep themselves away from many odd situations. "I don’t do special exercise like jogging, yoga etc. but I observe maun and other self-controlling exercises, time to time. I am highly influenced from my family ancestors and leaders like Mahatma Gandhi and Sardar Patel who used to walk a lot in their life. My recent walk was coincidently planned on the historical date 12 March which was the day on which Dandi March was started by Mahatma Gandhi, in 1930, in Gujarat. In fact, my walk was aimed to experience peace within, so I tagged this walk as Shanti Yatra i.e. a Peace March. However, my walk was an individual march without any political intention relevance or connection. It was also my sincere intension during my walk also requested to vehicle-riders 'Not to blow horn unnecessarily’, etc. I am originally from a village of Gujarat and living in a metro city Delhi from last 19 years. Besides, due to my budget constraints and my inability to maintain a vehicle, I do not own a vehicle like other office-goers and also because of my belief that including one more vehicle in Delhi may add-up the pollution. Since, there is lack of buses in my route; I have no other option but to hire auto-rickshaws, taxies or cabs. Being a Delhite and belonging to working class, I often face problems in reaching my destinations on time due to non-availability of vehicle and odd behavior of transporters, everyday in the city. Though, I cannot escape from all these odds in daily routine, I decide to change my daily routine at least for once in a year by walking on Delhi footpaths.